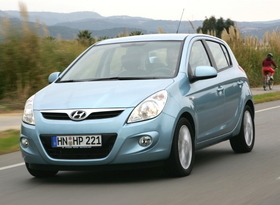 The Hyundai i20 (shown) competes with cars such as the Ford Fiesta. NEW DELHI (Reuters) -- Hyundai plans to move more than a third of its i20 car production in India to Europe by the middle of 2010, the managing director of its Indian unit said on Friday. H.S. Lheem told reporters the automaker would shift production of about 70,000 cars a year to Europe to get tax benefits. The company currently has an annual capacity to make 200,000 i20 cars in India. Lheem did not say where the i20, which is a rival to cars such as the Ford Fiesta, could be built in Europe. Hyundai has a plant in the Czech Republic that produces Hyundai i30 hatchback and station wagon models for the European market. The automaker also has a car production factory in Turkey. Lheem said the company's car sales in India are expected to increase to 580,000 in the year to December from 490,000 last year.